Hello! I am Licensed Professional Counselor in the state of Georgia. I’m looking forward to our work together. It’s an incredible joy and honor to walk with you and to be a guide on the healing journey you have set out on. Working together there is a lot of transformation that can happen in your life. I have effectively helped many people and have specialized training to do so. Growth can be difficult and sometimes things get worse before they get better. The outcome of therapy is largely dependent on your willingness and commitment to the process. Life can present many challenges including years of trauma, painful grief, anxiety, depression, and years of addictions. Transitions such as losing a career, lifestyle change, loss of a friend or family member or an identity crisis are also challenges that one can experience in life. There is hope! Through the use of a Dialectic Behavioral Therapy approach we can explore the thoughts, emotions, and behaviors related to various situations and learn to alter them when needed for the better. Through this process it is possible to learn skills to use to better manage behaviors. While my primary theoretical orientations are Dialectic Behavioral Therapy, Cognitive Behavioral Therapy and Solution Focused Therapy, I recognize that each client is unique. I therefore, tailor counseling needs to each individual. In addition, should clients desire faith-based counseling, I do incorporate Christian related principles. Help is only a message away! I cannot thank Adeola enough for everything she has done for me. I've had to let go of BetterHelp for financial reasons, and it breaks my heart to let go of such an amazing, encouraging presence in my life that Adeola brought in buckets. She talked me through the demons and shone a light on the flimsy stories I have told myself for as long as I can remember. And she exposed them as nothing more than shadows. She didn't let me bully myself, and she never let me give up, and I'll be forever grateful to her. I feel so blessed to have Adeola as my counselor, she is very patient and gives me great advise when needed. She is a God sent I feel like she truly cares for me and my wellbeing! I’ve been working through some issues with anxiety and Adeola has been there for me. I appreciate having someone guide me on the path to a healthier mindset. She is patient and kind. Adeola is easy to talk to and provides lots of worksheets for me to read over that relate to the issues I am wanting to work on. Our sessions thus far have been helpful and I look forward to continuing to work with her. This has been the first time I've spoken to a counselor. It has been a great experience. I've learned some skills to help me deal with my anxieties and they really help. Adeola has been great to talk with. She also is very accommodating to your schedule and is very understanding. I am so glad I decided to try this with her. My experience with Adeola is beyond awesome. I’ve seen several counselors before. I even spent years with them, but I never felt more connected, more understood and felt like I related with someone than I did with Adeola. I can see that she’s familiar with my issues. I did feel like I can express myself openly and without fear. She’s honest with me which is really helpful. I keep smiling during and after the sessions because she understands, cares, and helps me to think the right way. Before joining BetterHelp, I was very reluctant to speak to a counselor and share my thoughts and feeling although I was really struggling with several personal stressors. I had also never spoken to a counselor before. When I started to talk to Adeola, even after the first session I immediately felt much better, comfortable and more confident. She is an excellent listener, empathetic and devoted to her patients. She remembers all the details of things I tell her even in the past, and is always makes an extra effort to be there for me when I need her the most. She also checks up on me through the chat when she knows I have a stressful event coming up, and lets me talk even longer than duration of the scheduled session when she feels I need more time, which I really appreciate. Even after just one month, I feel so much better and stronger because of her. I am so thankful and look forward to working with for as long as possible. I was skeptical about online counseling but this far the experience has been good Adeola has a very warm approach and I look forward to our discussion - I feel she is in tune to what my issues are right now and has taken time to stay up to date with my progression and what’s happening with my life - overall well paced and I’m no longer a sceptic - the online counseling with calls is useful. Adeola has been very helpful! She's friendly and easy to talk to, and she clearly knows her stuff. I've felt better since I started talking to her. 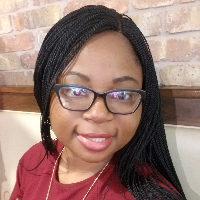 Would you like to write a review for ADEOLA ADEFOWOJU? We'd appreciate if you can spend a couple of minutes to write a short review for ADEOLA ADEFOWOJU (MA, LPC, NCC). This review would be shared with ADEOLA ADEFOWOJU. It may also be posted in our website or in ADEOLA ADEFOWOJU's profile but it would be anonymous and your identity would be kept completely confidential.